I’ve known Peter Rutter at VFE Pedals for a while now. He’s been a long time supporter of EffectsBay, and it’s been really cool to see this company get bigger and better as the years go by. For those of you not familiar with VFE Pedals, they’re a great company outside of Seattle, WA developing highly versatile pedals. I’ve had the opportunity to play with a few VFE Pedals, and the versatility is what always comes to mind. They do an excellent job of allowing you to dial in the tone, from intuitive controls for shaping the sound as well as providing internal trim pots to manage the frequencies on the outside of the enclosure. 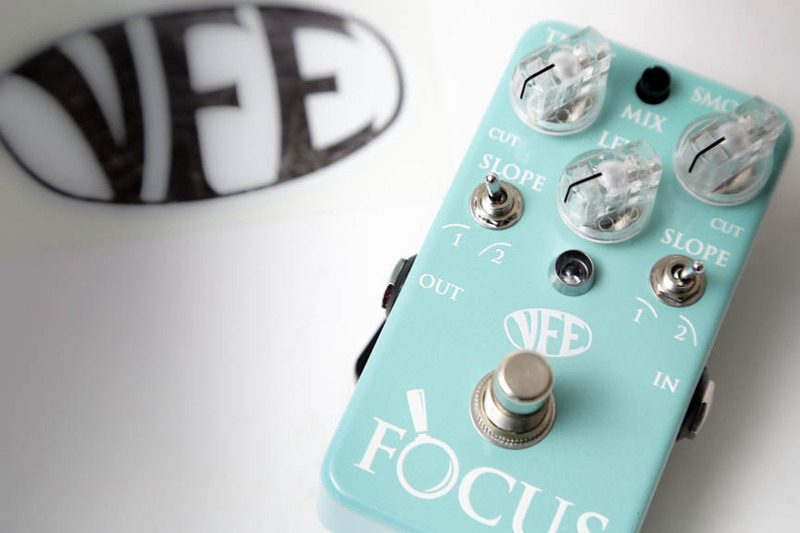 Peter sent over the Focus pedal for me to give a spin. Well, I have to say this may be the best VFE Pedal I’ve had an opportunity to play. This pedal is incredibly well thought out. What they wanted to achieve with the Focus was provide the classic TS9 tubescreamer mid boost, but with MUCH more flexibility. In those tubescreamer, the technique was to drop the gain and raise the output. That midrange boost, is ideal for getting the leads on top of the mix. So many dirt boxes, just focus on the treble and bass, but the mids.. is where it’s at if you want to stand out. TIGHT: Basically this is a hi pass filter. It is stated that it varies the frequency of the cutoff point of the high pass. Turning fully counter clockwise, you reach *ear knife* frequencies.. basically cutting off all bass frequencies. SMOOTH: Is the opposite of the TIGHT. This control varies the frequency cutoff point of the low pass filters. Turning it fully clockwise, you have massive lows. I was getting all sorts of great tones by adjusting these two knobs. MIX: is a small trim pot at the top, and again, I thought this was a great addition. MIX blends the dry signal with the EQ section (clockwise adds the EQ and counter clockwise gives dry signal). So if you wanted a little bit of your TIGHT and SMOOTH, you can dial exactly what you want! Again, another option for dialing in the perfect tone you’re looking for! LEVEL: controls the output of the Focus pedal. Personally, I was loving it cranked or a couple of clicks away from cranked. But don’t get me wrong sounds great at all levels. Lower levels adds a fantastic bit of *medium grit* I like to call it. Awesome. SLOPE: toggle switches under TIGHT and SMOOTH controls. It took me a couple of tweaks to fully understand what’s going on here. SLOPE switches affect how sharp the cutoff is. With 1 pole, the cutoff is a rather gentle slope, and at 2 pole it’s a much sharper dropoff of the frequencies you are cutting. Under the hood there are two trim pots. The primary trim post controls the amount of clean gain in the dry signal path. The other trim pot (which I thought was great) controls the brightness of the LED! I like bright LEDs, but lately some of these pedals out there are bordering on laser LEDs.. so the option to dial it down is a great touch by VFE. I played this pedal with a Rivera Knucklehead and a Matchless HC30 into a Avatar 2×12 with Vintage 30 and G12H30 cabinet (closed back) with an AVRI Fender Jazzmaster.. and I was thoroughly impressed with what this pedal was delivering. I think this would be a fantastic purchase to cut through the mix for leads or rhythm. The pedal cleaned up nicely with rolling volume and handled high gain amps well as well as sounding great with clean. The bottom line.. you can get this pedal to cut through the mix. That says a lot. 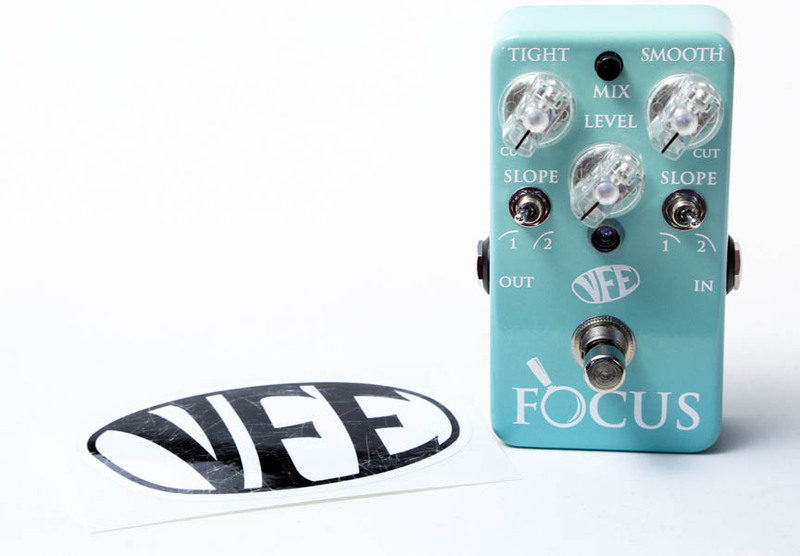 The VFE Pedals Focus is available on their Reverb store for $219 and includes FREE shipping. Pedal Line Friday - 9/26 - Rich WebberGood deal on the ModTone Clean Boost! Lightning Boy Audio – The Lightning Boy II Give Away! What? You're not going to do a giveaway? LOL!